Our dynamic team has positions available – find your fit. Quinte Children’s Homes is seeking qualified individuals for our Child & Youth Worker positions. These hourly rate positions range between $14.00-$18.00 per hour based on your level of education and professional experience. Schedules are provided well in advance and may include days, evenings and weekends on a rotational basis. As a Child & Youth Worker, you will be working in a variety of Parent Therapist Homes supporting children between the ages of 6-18 in the achievement of their individual treatment goals. If you meet the qualifications and would like to be considered for a Child and Youth Worker position please submit resume and covering letter by October 1st, 2018. Prior to interview, the following information may be requested. Quinte Children’s Homes is seeking qualified individuals for our Child & Youth Worker positions. These self-employed hourly rate positions range between $14.00-$16.00 per hour based on your level of education and professional experience. As a contracted Child & Youth Worker, you will accept shifts working in a variety of Parent Therapist Homes supporting children between the ages of 6-18 in the achievement of their individual treatment goals. If you meet the qualifications and would like to be considered for a Child and Youth Worker position please provide the following information to be considered for an interview. Only those who submit these requirements will be contacted. 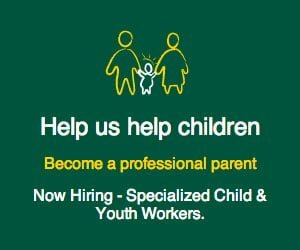 Quinte Children’s Homes is seeking qualified individuals / couples for Professional Parent Therapist positions to care for children between the ages of 6-18. You will receive a daily tax-free living allowance while working in your home and have opportunities to enhance your professional skills and knowledge by participating in regular therapeutic training such as free Therapeutic Crisis Intervention training.